China is an extraordinary nation of over 1.3 billion people, all of whom at this moment are trying to run over me on their Mopeds. It is hugemongous, an ancient Chinese word meaning 3.7 million square miles. Despite an official one-child-per-family policy, the Chinese people are continuing to be fruitful and multiplying, and consequently the nation is packed like Cantonese sardines. The population of Shanghai is over 23 million. Beijing is over 20 million, and tiny Nanjing a mere 8 million, making it a veritable Mandarin Mayberry. Claudia should open a Step Ahead Foundation branch office here. A generation ago, China was an agrarian nation with folks getting around by bicycles and rickshaws. It is now a nation connected by high speed trains propelling people from one massive urban center to another. And in the cities most everyone seems to get around by riding the previously mentioned Mopeds at high rates of speed, threatening the lives of innocent American tourists. In America we hardly even repair potholes any more, while here in China billions are being spent on the infrastructure and new skyscrapers are being erected overnight. 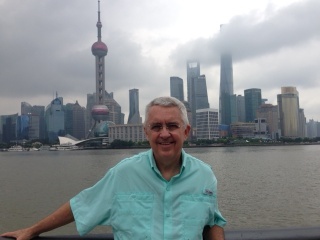 The Shanghai skyline makes Manhattan look like Memphis in comparison. The downside to this breathtaking growth is chronic pollution. In the three days we have been here, we have not seen the sun. Will tells us the haze we see is not the weather. It is filthy air that covers urban China on pretty much a daily basis. Chinese politicians are apparently like Tennessee legislators. They think global (cough) warming (cough) is a (cough) myth. Chinese tea is hot and not sweet. At a restaurant last night I asked for some ice and almost set off an international incident. There seems to be little or no interest here in the upcoming SEC football season. China Daily did not cover SEC Media Days. From all appearances, China is taking all the interest money we Americans are paying Beijing these days and building an incredible nation that may indeed make the 21st Century the Chinese Century just as the 20th Century was the American Century. I sure hope President Trump can turn this situation around. NEXT WEEK: Chinese cuisine, Chinese TV, and how panhandlers here have PA systems. Peggy McClure: Get Will to teach you in Mandarin "Big Orange!" Have fun with your gang. I understand that Ken is joining you at some point. Roy Herron: Billy, I'm glad your wit and wisdom still come across umpteen-thousand miles. Can hardly wait to hear more.